A yearbook is a historical object, an artistic and creative work, and a personal souvenir, all in one. Cortex, the yearbook of the College of Medicine of the University of California, Irvine, offers a fine example of the wealth of information that yearbooks have to offer. Started in 1915, Cortex accompanied and documented the growth of the College of Medicine from its beginning as an osteopathic school in Los Angeles to its present incarnation at UCI. 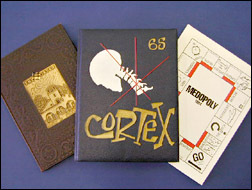 In addition to its capacity as a historical resource for the College of Medicine, Cortex exemplifies the yearbook tradition. Using volumes of Cortex ranging from 1930 to 1992, this exhibit explored some of the main functions and features of a yearbook including its historical function, cover art, documentation of the student experience, and the perennial appeal of yearbook humor. The yearbooks on exhibit were a sampling of the nearly 100 College of Medicine yearbooks housed in the UCI Libraries' Department of Special Collections and Archives.